Draft: 2010, Tampa Bay Rays, 31st rd. Kevin and his wife, Marisa, welcomed their first child, Karter James, on Nov 12...Besides the birth of his son, the highlight of his offseason was catching a 38-pound carp while bowfishing with his brother, Steve, in Indiana, just five pounds off the state record…they named the fish "Bruiser"…the catch was made from his new custom boat, christened "Outlaw Bowfishing," or just "The OB" for short...He participated in Mychal Givens' charity Blitzball tournament this winter, a game similar to Wiffle ball featuring a plastic ball with exaggerated movement…he was teammates with former Rays outfielder Mallex Smith…Kevin joked he was happy just to put the ball in play from 40 feet away thanks to the skill of the kids pitching...After Kevin injured his right thumb, he found a way to satisfy his baseball craving by shagging fly balls during batting practice…he'd catch the ball with his glove on his hand, drop the glove and throw the ball back left-handed...He worked out with Tyler Glasnow, Ryan Yarbrough and Ryne Stanek at Diesel Fitness in Tampa this offseason…he also regularly worked out with Ozzie Timmons at the University of Tampa, instructing college players on outfield defense and base stealing...Kevin maintains his claim as "Tampa's most dedicated Purdue fan"…after two All-American seasons in junior college, he originally signed a letter of intent to play for the Boilermakers before signing with the Rays...His older brother, Dan, was promoted to assistant head groundskeeper for the Cubs ahead of the 2018 season. Was limited to a career-low 88 games, missing significant time for a third consecutive season… missed 57 games with a torn ligament in his right thumb, April 16-June 18…was transferred to the 60-day DL on April 17...Despite the missed time, ranked 3rd in the AL with 9 3B, one shy of Mallex Smith and CWS Yolmer Sánchez...Appeared in 88 games and made 86 starts, all in center field, including 22 starts against lefties...Won his second Wilson Defensive Player of the Year Award in center field (also 2016)…despite his missed time, his 14 Defensive Runs Saved in center field ranked 3rd in the majors to MIL Lorenzo Cain (20) and ATL Ender Inciarte (17)...Made his fourth consecutive Opening Day roster, all starts in center field, most in club history, breaking a tie with Desmond Jennings and B.J. Upton…on the first pitch on Opening Day vs. BOS, caught a fly ball in left-center off the bat of Mookie Betts…he was awarded a "5-Star Catch," defined as any ball caught with a 0-to-25 pct. catch probability, from StatCast…he covered 129 feet in 6.3 seconds, and the play was given a 6 pct. catch probability...His first 34 starts after returning from the 60-day DL came at leadoff, but he hit just .196/ .270/.343 (28-for-143) over that stretch…moved down in the order for his final 40 starts, beginning Aug 5, and hit .253/.304/.438 (37-for-146) through the remainder of the season...On June 25 vs. WAS, tied his career high with 4 RBI on the second grand slam of his career, off Gio Gonzalez in the 2nd inning…was his first homer since Sep 24, 2017 at BAL and the first grand slam hit by a Ray at Tropicana Field since Colby Rasmus on May 10, 2017 vs. KC… was the first time a Rays lefty hit a grand slam off a left-handed pitcher since Matt Joyce on May 25, 2012 at BOS…it was the fourth time in club history the Rays got a grand slam from their leadoff hitter...Suffered a hairline fracture in his right foot on Sep 26 vs. NYY…was hit by pitch in the 1st inning and left the game in the 4th…missed the final 4 games…was hitless in his last 17 AB of the season. Established a career high in home runs for a third consecutive year…went from a careerhigh-tying 10 HR in 2015 to 12 HR in 2016 and 15 HR in 2017... Is one of eight AL players with double-digit homers and steals in each of the last three seasons and one of three AL outfielders to do that, along with BOS Mookie Betts and LAA Mike Trout… he and Steven Souza Jr. became the first Rays players with a 15-HR, 15-SB season since Melvin Upton Jr. in 2012... Is the first Ray with three straight seasons of 15 SB since Desmond Jennings (4) from 2011-14... Appeared in 98 games with 95 starts, all in center field, including 32 starts against lefthanded starters…was on the disabled list from June 9-Aug 17 (right hip fracture), missing 61 games…the Rays went 29-32 (.475) during his disabled list stint, compared to 14-34 (.292) in 2016 when he missed 48 games with a fractured hand... After being reinstated from the 60-day DL, hit .306/.352/.517 (45-for-147) with 5 2B, 1 3B, 8 HR and 19 RBI in 36 games (35 starts)…hit leadoff in all 35 of those starts... Ended the season having reached base safely in a career-high 20 straight starts... Hit .314/.357/.551 (77-for-245) with 14 HR and 32 RBI over his last 61 games (60 starts), starting May 12... Hit 3 leadoff home runs, all after returning from the disabled list…his first was Aug 20 vs. SEA and its estimated distance, according to StatCast, was 443 feet, his longest since StatCast data is available (2015)... Twice homered in 3 straight games: May 30- June 2 at TEX/SEA and Sep 12-15 vs. NYY/BOS... According to FanGraphs, ranked 4th in the majors, 3rd among outfielders and 2nd among center fielders with 22 Defensive Runs Saved… since his rookie season in 2014, has 90 DRS (in 3,175 innings), tops among all outfielders and 2nd among all major league fielders…achieved this despite spending 109 games on the disabled list over the last two seasons... Despite his 22 DRS, his 6 errors ranked 3rd among major league center fielders…all 6 came from April 26-June 8, matching his total from his previous 235 games…three of his errors led to "little league home runs"…made 3 errors in the 4-game series from May 8-11 vs. KC... On March 20, signed a six-year contract with a club option for 2023…the deal was worth a guaranteed $53.5 million and could raise to $66.15 million with the option and incentives... Made his third consecutive Opening Day roster, all starts in center field... On April 9 vs. TOR, was ejected by home plate umpire Mike Muchlinski for arguing balls and strikes, his first career ejection... On April 19 vs. DET, his 4 runs were a career high and the most by a Ray since Wil Myers exactly three years prior-on April 19, 2014 vs. NYY... On May 17 at CLE, robbed Jason Kipnis of a homer to clinch a 7-4 victory, his fourth home run robbery since the start of 2014…according to ESPN. com's Mark Simon, it was the first game-ending home run robbery for the Rays since Baseball Info Solutions began tracking robbed homers in 2003... On May 31 at TEX, his 9th-inning solo homer was the sixth time in franchise history there was a game-tying homer with two outs in the 9th inning, first since Dan Johnson on Sep 28, 2011 vs. NYY ("Game 162")…it was the first time the Rays did that on the road since Ty Wigginton on April 22, 2006 at TEX... On Aug 23 vs. TOR, homered in consecutive at-bats, in the 3rd and 5th innings off Marcus Stroman, for the second multi-HR game of his career (also Sep 8, 2016 at NYY)... On Sep 15 vs. BOS, made a diving catch in the 9th inning and leaping catch in the 10th, robbing Jackie Bradley Jr. and Mookie Betts of extra-base hits…homered in the 14th inning, the third time in club history there was a game-tying homer in extras (last Desmond Jennings, Aug 4, 2011 vs. TOR, 10th inning) and the latest in a game the Rays ever got one…the Rays lost 13-6 in 15 innings... On Sep 24 at BAL, homered on the first pitch of the game, the ninth time that happened in franchise history and first since Desmond Jennings on April 16, 2013 at BAL. Established career highs with 12 HR, 21 SB, 40 BB and a .331 OBP despite missing 48 games with a fractured left hand…the Rays went 14-34 in his absence…they were 48-54 (.471) in his 102 starts, compared to 20-40 (.333) otherwise...For the second consecutive season, claimed the Rawlings American League Gold Glove Award for center field…won the award over finalists TOR Kevin Pillar and BOS Jackie Bradley Jr. …joined 3B Evan Longoria as the only players in franchise history to win multiple Gold Glove awards...His 25 Defensive Runs Saved led all major league center fielders and ranked 2nd among all players behind BOS Mookie Betts (32), according to FanGraphs…his combined 67 DRS over the past two seasons are 24 more than any other player in baseball...Since 2000, only two players played in fewer games at their position than Kiermaier (104) and won a Gold Glove: Rangers C Iván Rodríguez (87) in 2000 and Twins CF Torii Hunter (93) in 2005...Joined SEA Ichiro Suzuki (2001-02) as the only AL outfielders to win a Gold Glove in each of their first two full seasons in the majors, dating back to when the awards were first presented in 1957...Is one of eight players to win a Gold Glove after being drafted in the 30th round or later and the sixth of those players-but only outfielder-to win it more than once...Returned from the DL for the Rays first game after the All-Star break…in the second half, his 7 outfield assists tied HOU Jake Marisnick for most among AL center fielders and his 175 putouts ranked 2nd to SEA Leonys Martín (192)...Led the Rays with 5.5 Wins Above Replacement, which accounts for offensive, defensive and baserunning contributions…over the last two seasons (2015-16) his 12.8 WAR rank 5th in the AL, trailing only LAA Mike Trout (19.9), TOR Josh Donaldson (16.3), BOS Mookie Betts (15.5) and BAL Manny Machado (13.7)- yet Kiermaier has played at least 47 fewer games than any of those four...Moved into the No. 2 spot in the batting order on Aug 2, and from that date through season's end he hit .278/.350/.434 (55-for-198) with 31 runs, 8 2B, 1 3B, 7 HR, 19 RBI, 17 BB, 5 HBP and 12 SB in 52 games…also had 4 bunt singles after this move, and none in 53 games prior to that...In his final 27 games beginning Aug 31, batted .311/.393/.495 (32-for-103) with 18 runs, 2 2B, 1 3B, 5 HR, 11 RBI, 9 BB, 5 HBP and 8 SB…raised his season avg. from .221 to .246 and his OBP from .306 to .331...Was successful on 21 of 24 SB attempts (87.5 pct. ), 3rd-best rate in the AL (min. 20 attempts) behind MIN Brian Dozier (90.0) and CLE Rajai Davis (87.8)…it was also the 3rd-best rate in Rays history behind Desmond Jennings (93.9) in 2012 and Ben Zobrist (88.9) in 2010…was successful on 19 of his last 20 attempts...More than doubled his walk rate from 2015… drew 40 BB in 414 PA, compared to 24 BB in 535 PA in 2015…drew only 11 BB in 137 PA before the All-Star break, but collected a teamleading 29 BB in 277 PA in the second half...Batted .262 (22-for-84) vs. left-handed pitching, better than his .241 mark vs. RHP...At 25 years, 11 months, was the youngest position player on the Rays Opening Day roster…made his second career Opening Day roster, both starts in CF...Began his season batting .154 (4-for-26) over his first 10 games, without an extra-base hit… his first XBH came on April 17 vs. CWS and began a streak of 6 games with one, tied for the 2nd-longest streak in club history…Evan Longoria went 8 straight games in Sep 2009...On April 19 at BOS, homered in the 10th inning off Matt Barnes to break a scoreless tie in the Rays 3-0 win…it was the Rays first extra-inning win since June 3, 2015 at LAA, ending an 11- game losing streak in extra-inning games...On May 21 at DET, sustained two fractures in his left hand while diving for James McCann's single in the 5th inning…underwent surgery on May 24 in St. Petersburg, performed by Dr. Doug Carlan…played in 2 rehab games for Class-A Charlotte and was reinstated from the DL on July 15 vs. BAL...Compiled a career-long 13-game hitting streak from Aug 27-Sep 9, batting .407 (22-for-54)…it was the longest hitting streak by a Ray since Luke Scott from June 5-21, 2013 (13)...On Sep 8 at NYY, had the first multi-HR game of his career with a pair of solo shots off CC Sabathia in his first two trips to the plate… became the first Rays left-handed hitter with 2 HR off a LHP since Johnny Damon on Aug 29, 2011 at TOR…also became the first player in club history with a 4-hit, 2-HR game vs. the Yankees (home or away)...On Sep 16 at BAL, robbed Hyun Soo Kim of a potential grand slam in the 7th inning as the ball deflected off his glove and fell to the warning track for an RBI single. Made 131 starts, all but two in CF...won his first Rawlings Gold Glove Award, the sixth in Rays history and second by a Rays outfielder, joining LF Carl Crawford (2010)...was later announced as the Rawlings American League Platinum Glove Award winner, along with Cardinals C Yadier Molina, as the best defender at any position...also named Defensive Player of the Year in the 2015 Esurance MLB Awards, beating out Braves SS Andrelton Simmons and Rockies 3B Nolan Arenado. Became the seventh AL outfielder to win a Gold Glove in his first full season, as well as the eighth player to win a Gold Glove after being drafted in the 30th round or later. Led all major league players with 42 Defensive Runs Saved-the highest mark since 2003, when Baseball Info Solutions started tracking it...DRS attempts to calculate how many runs a player saved or cost his team in the field compared to the average player at his position...Kiermaier nearly doubled the total of the next-closest AL player, TOR Kevin Pillar (22), despite playing 193.1 fewer innings…Ranked 3rd in the AL with 7.4 Wins Above Replacement (WAR), trailing only LAA Mike Trout (9.4) and TOR Josh Donaldson (8.8)...only two players in Rays history have posted a higher WAR: Ben Zobrist (8.7 in 2011, 8.6 in 2009) and Evan Longoria (8.1 in 2010)…Led all major league center fielders with 15 assists, one shy of Melvin Upton Jr.'s club record for a CF (2008)...on his final assist of the year, Oct 1 vs. MIA, he threw out the potential tying run (J.T. Realmuto) at the plate in the 7th inning, a throw that was measured at 100.4 mph, per MLB StatCast…In fact, he made nine throws from the outfield that were clocked at or above 100 mph-representing one-fourth of all such cases in the majors in 2015...the next closest was MIL/HOU Carlos Gomez (five)…Tallied 10 Web Gems on ESPN's Baseball Tonight (5th in the majors), including five No. 1 Web Gems (2nd in majors). On Aug 31 at BAL, robbed Manny Machado of a leadoff homer in the 1st inning...just two weeks earlier (Aug 14 at TEX), he robbed Prince Fielder...according to ESPN Stats & Info, was one of five players with multiple home run robberies in 2015, along with LAA Mike Trout (3), SD/TEX Will Venable (2), CWS Avisail Garcia (2) and BOS Mookie Betts (2)…Has batted exactly .263 with 10 HR in each of his first two seasons...led the Rays in triples (12), stolen bases (18) and batting avg. with RISP (.297)...22 of his 40 RBI came with 2 out, 2nd most on the team…His 12 triples were 2nd in the majors behind MIN Eddie Rosario (15)...he, Rosario, HOU Evan Gattis and ARI David Peralta were the only major leaguers with at least 10 HR and 10 3B...the only two AL East players to reach 12 triples in one season in the last 12 years are Rays: Carl Crawford (2004-06, 2010) and Kiermaier…Reached 20 career triples in his 230th major league game...since World War II, only five others have reached 20 triples as fast: PIT Gus Bell (214, 1951-52), BRO Jim Gilliam (195, 1953-54), STL Garry Templeton (204, 1976-77), PHI Juan Samuel (168 games, 1983-84) and most recently ANA Chone Figgins (229, 2003-04)...the Rays all-time triples leader, Carl Crawford (105), didn't get his 20th triple until his 270th game…Is the first player to get 20 HR and 20 3B in his first two seasons since Bell in 1951...is just the second active player to get 20 3B in his first two seasons, joining DET Austin Jackson (2010-11)...since hitting his first career triple June 3, 2014, he leads the majors in three-baggers...is one of only two outfielders in the last 60 years with 20 triples and 20 assists in his first two seasons, joining SD Gene Richards in 1978…Seventeen of his career triples have come on the road in only 126 games...he became the fourth opposing player in the last 50 years to hit 3 triples in one season at Yankee Stadium (new or old) and the first to do it in new Yankee Stadium...joined TOR Shannon Stewart in 1997, DET Larry Herndon in 1982 and BAL Paul Blair in 1967…Was credited with 10 "hustle" extra-base hits as deemed by the Rays PR staff…Batted .284 after the All-Star break, one point higher than LAA Mike Trout…In a 12-3 win on April 24 vs. TOR, he circled the bases on an error by LF Steve Tolleson...according to the Elias Sports Bureau, he was the first Ray to score on a four-base error and the first to do it in the majors since NYM Jason Bay on April 21, 2011 vs. HOU, on an 8th-inning error by RF Hunter Pence. ..Hit the Rays only extra-inning home run, a solo HR in a 10-inning, 6-5 win on June 3 at LAA off Huston Street...entered the game in the 7th as a PH...also had his first walk-off RBI on Sep 20 vs. BAL, when he delivered a two-out infield single in the 9th inning off Zach Britton to give the Rays a 7-6 win…Hit 2 HR off lefties, both coming in a span of 3 PA...homered Sep 24 at BAL off Wade Miley (one of only three Miley allowed to a left-handed hitter) and Sep 26 at TOR off David Price (one of only four Price allowed to a lefty)...had only 1 HR in previous 216 PA vs. LHP…Was the winner of the MLB Alumni Association's Rays Heart and Hustle Award for the second straight year...the award honors active players who demonstrate a passion for the game of baseball and best embody the values, spirit and tradition of the game...the Heart and Hustle Award is also the only award in MLB that is voted on by former players...in 2014 was just the second Rays rookie to be nominated, joining Brendan Harris (2007). Rookie appeared in 108 games, including 89 starts (47-RF, 32-CF)...led the team with 8 triples, while his .450 SLG and .765 OPS led Rays players with at least 100 games played...opened the season with Triple-A Durham and saw two brief call-ups (April 11-12 and May 17-21) before being recalled to stay May 28...Named one of three final ists for the Rawlings AL Gold Glove Award for right field...LAA Kole Calhoun and winner BAL Nick Markakis were the other finalists...was one of three rookies chosen as a Gold Glove finalist, along with CIN Billy Hamilton and BOS Jackie Bradley Jr...Named the Rays winner of the Heart and Hustle Award by the Major League Baseball Players Alumni Association...the award honors active players who demonstrate a passion for baseball and best embody the values, spirit and tradition of the game...joined Brendan Harris (2007) as the only Rays rookies to be nominated...Selected to Baseball America's postseason All-Rookie Team, alongside outfielders HOU George Springer and CIN Billy Hamilton...His 8 triples led AL rookies and were the most by a Rays rookie since Akinori Iwamura had a club-rookie-record 10 in 2007...the last Ray with that many was Carl Crawford (13) in 2010...Only one other Rays rookie has achieved his combination of triples (8) and home runs (10): Rocco Baldelli (11-HR, 8-3B) in 2003...the only other AL rookie to do this since 2000 was LAA Mike Trout (30-HR, 8-3B) in 2012...His 10 HR for the Rays were his most of any stop in his pro career...7 of the 10 came in his first 36 games, spanning 113 AB...hit a combined 13 HR in 474 AB between the Rays and Durham, exceeding his minor league career total entering the season (12 HR in 1,320 AB)...His .450 SLG ranked 3rd among AL rookies (min. 100 games), trailing CWS Jose Abreu (.581) and MIN Danny Santana (.472)...it ranked 4th all-time among Rays rookies, and was the best since Evan Longoria (.531) in 2008...For the first two months after his final call-up (May 28-July 28), paced the Rays with a .315 avg., .370 OBP, .548 SLG, 7 HR, 4 3B and 21 extra-base hits...from May 28 through season's end, his 9 HR ranked 2nd on the team to Evan Longoria (17)...Batted .280/.342/.498 (72-for-257) with 9 HR vs. RHP, compared to only .203/.213/.284 (15-for-74) with 1 HR vs. LHP...only 13 of his 89 starts came vs. lefties...Collected his first major league hit May 17 at LAA, an infield single off C.J. Wilson...the next day hit his first career homer, a 2-run, opposite-field shot in the 7th off Mike Morin...earlier in that game made a leaping catch against the right-center field wall to rob Erick Aybar of extra bases and earn the top Web Gem on ESPN's Baseball Tonight...Hit an inside-the-park home run May 31 at BOS, the first player to do so within his first 10 major league games since CWS Joe Borchard in 2002...became the first visiting player to hit an inside-the-park home run at Fenway Park since BAL David Newhan on July 21, 2004...became the first Rays rookie to homer in his first career game at Fenway Park since Brent Abernathy on June 25, 2001...Tied a franchise record with 2 triples July 5 at DET (12th time, sixth different player)...On July 9 vs. KC, went 4-for-4 and hit his first grand slam, the first Rays rookie ever to record 4 hits and a slam...became the first rookie on record (since 1914) with 4 hits and a grand slam from the No. 9 spot, and the first player (regardless of rookie status) to do it since CLE Asdrubal Cabrera on April 18, 2009 at NYY...Had 5 outfield assists, most by a Rays rookie since Delmon Young (16) in 2007...ranked among the AL's top 10 outfielders in zone rating, range factor per 9 innings and total chances per 9 innings...6 errors tied for 4th most among AL outfielders and were most by a Rays outfielder since B.J. Upton (8) in 2008...In his first major league start (April 12 at CIN), threw out Joey Votto at home on a single to CF by Brandon Phillips in the 4th...the assist preserved a 1-0 lead for Alex Cobb, and the Rays held on to win by the same score...Claimed the No. 1 spot on ESPN SportsCenter's Top 10 Plays twice in a span of 10 days...on June 11 vs. STL, his bases-loaded, inning-ending diving catch in right-center field robbed STL Peter Bourjos and preserved the lead...on June 20 vs. HOU, dove for a George Springer foul ball near the Rays bullpen...Despite playing only 34 games for Durham, was selected as Best Defensive Outfielder in the International League by Baseball America. Played in 2 games for the Rays, both as a lateinning defensive replacement in CF: the Game 163 tiebreaker at Texas and the AL Wild Card Game at Cleveland…was not on the ALDS roster…has yet to record an at-bat…despite those 2 games, has not yet accrued any major league service time as tiebreakers and postseason games do not count toward it... Selected off the Triple-A Durham roster on Sep 30-the day of Game 163….became the first player to make his major league debut in a single-game tiebreaker and just the second to make his major league debut in his team's 163rd game of a season or later, according to the Elias Sports Bureau…the other was Elvio Jimenez with the Yankees in their 164th and final game of the 1964 season... Found out he was being called up late on Sep 29 and joined the Rays in Texas the next morning…due to the Rays expanded roster (37 active players), he shared a locker with Wil Myers in the visitors' clubhouse... Caught Joe Maddon's attention in spring training when he delivered a 2-run double in the Rays spring home opener vs. Pittsburgh and hustled into 2B after being accidentally tripped by Pirates 1B Clint Robinson…he was brought over from the minor league camp for the day since the Rays opened the spring season with a doubleheader... Spent most of the season at Double-A Montgomery before a late-July promotion to Durham…batted a combined .295 (150-for-508) with 89 runs scored and 21 SB in 136 games…named a Southern League midseason and postseason All-Star... Named Montgomery's Team MVP after batting .307 (114-for-371) in 97 games…missed out on the Southern League batting title by just .001, trailing Justin Greene of Mobile (D-backs)... Has played all three outfield positions, but was used in CF exclusively in 2013…batted primarily leadoff for both the Biscuits and Bulls... Had a combined 15 triples, tied for 4th most in all of minor league baseball and tied for the most ever by a Rays farmhand…matched Hak-Ju Lee who had 15 in 2011 Started all 8 of the Bulls postseason games and scored a team-high 6 runs…delivered a two-run homer and RBI single in the Bulls 7-0 win at Pawtucket (Red Sox), clinching the International League Championship... Named Best Defensive Player in the Rays minor league system for the second consecutive season…also named by Baseball America as the Rays No. 10 prospect, Best Defensive Outfielder and Best Outfield Arm following the season. June 19, 2018 Tampa Bay Rays activated CF Kevin Kiermaier from the 60-day injured list. 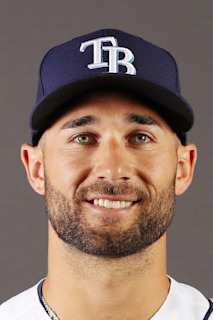 June 15, 2018 Tampa Bay Rays sent CF Kevin Kiermaier on a rehab assignment to Durham Bulls. June 12, 2018 Tampa Bay Rays sent CF Kevin Kiermaier on a rehab assignment to Charlotte Stone Crabs. April 17, 2018 Tampa Bay Rays transferred CF Kevin Kiermaier from the 10-day disabled list to the 60-day disabled list. Torn ligament in right thumb. April 16, 2018 Tampa Bay Rays placed CF Kevin Kiermaier on the 10-day disabled list. Torn ligament in right thumb. August 18, 2017 Tampa Bay Rays activated CF Kevin Kiermaier from the 60-day disabled list. July 27, 2017 Tampa Bay Rays sent OF Kevin Kiermaier on a rehab assignment to Charlotte Stone Crabs. June 28, 2017 Tampa Bay Rays transferred CF Kevin Kiermaier from the 10-day disabled list to the 60-day disabled list. Right hip fracture. June 9, 2017 Tampa Bay Rays placed CF Kevin Kiermaier on the 10-day disabled list. Right hip fracture. July 15, 2016 Tampa Bay Rays activated CF Kevin Kiermaier from the 15-day disabled list. July 13, 2016 Tampa Bay Rays sent OF Kevin Kiermaier on a rehab assignment to Charlotte Stone Crabs. July 11, 2016 Tampa Bay Rays sent CF Kevin Kiermaier on a rehab assignment to GCL Rays. May 28, 2014 Tampa Bay Rays recalled CF Kevin Kiermaier from Durham Bulls. May 22, 2014 Tampa Bay Rays optioned CF Kevin Kiermaier to Durham Bulls. May 17, 2014 Tampa Bay Rays recalled Kevin Kiermaier from Durham Bulls. April 13, 2014 Tampa Bay Rays optioned CF Kevin Kiermaier to Durham Bulls. April 11, 2014 Tampa Bay Rays recalled Kevin Kiermaier from Durham Bulls. March 13, 2014 Tampa Bay Rays optioned CF Kevin Kiermaier to Durham Bulls. October 12, 2013 Kevin Kiermaier roster status changed by Tampa Bay Rays. October 4, 2013 Tampa Bay Rays reassigned CF Kevin Kiermaier to the minor leagues. September 30, 2013 Tampa Bay Rays selected the contract of CF Kevin Kiermaier from Durham Bulls. July 24, 2013 Kevin Kiermaier assigned to Durham Bulls from Montgomery Biscuits. February 23, 2013 OF Kevin Kiermaier assigned to Tampa Bay Rays. September 4, 2012 Kevin Kiermaier assigned to Montgomery Biscuits from Durham Bulls. August 31, 2012 Kevin Kiermaier assigned to Durham Bulls from Charlotte Stone Crabs. July 15, 2012 Kevin Kiermaier roster status changed by Charlotte Stone Crabs. July 12, 2012 sent CF Kevin Kiermaier on a rehab assignment to GCL Rays. June 5, 2012 Charlotte Stone Crabs placed CF Kevin Kiermaier on the 7-day disabled list. May 25, 2012 Charlotte Stone Crabs activated CF Kevin Kiermaier from the 7-day disabled list. April 20, 2012 Charlotte Stone Crabs placed CF Kevin Kiermaier on the 7-day disabled list. April 1, 2012 CF Kevin Kiermaier assigned to Charlotte Stone Crabs from Bowling Green Hot Rods. March 8, 2012 OF Kevin Kiermaier assigned to Tampa Bay Rays. April 4, 2011 Kevin Kiermaier assigned to Bowling Green Hot Rods from Princeton Rays. March 25, 2011 OF Kevin Kiermaier assigned to Tampa Bay Rays. June 18, 2010 Kevin Kiermaier assigned to Princeton Rays from Tampa Bay Rays. June 17, 2010 Tampa Bay Rays signed OF Kevin Kiermaier.